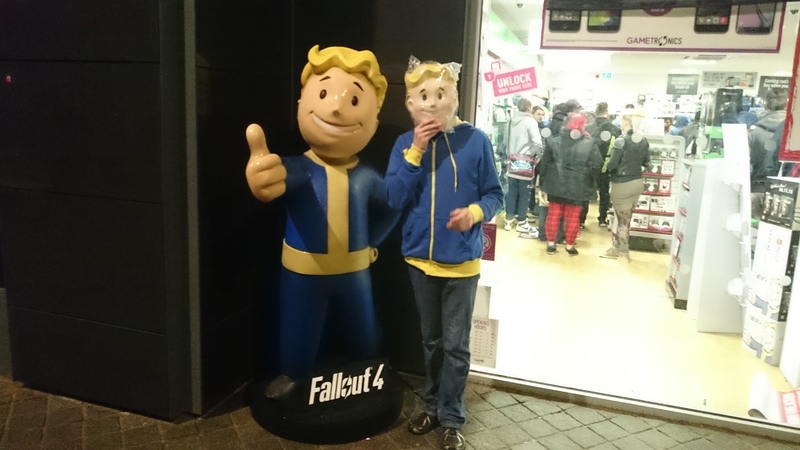 Even though we ordered our copy of Fallout 4 to be delivered by post on the 10th of October (UK release date), we couldn’t help ourselves from attending the midnight opening at our local GAME store. 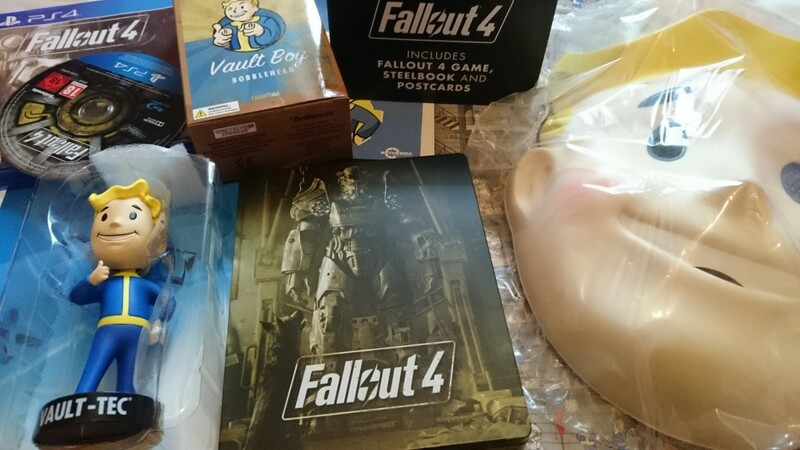 The fact that they had a competition where you could win a Fallout 4 branded Xbox One, A Fallout 4 Pip-boy edition and best of all a full sized Vault Boy statue may have swayed our decision to attend the event. Just look at this fella, who wouldn’t dream of having him in their living room! So we drove, parked and walked our way towards the store. I can tell you right now that you could feel the radiation in the air! 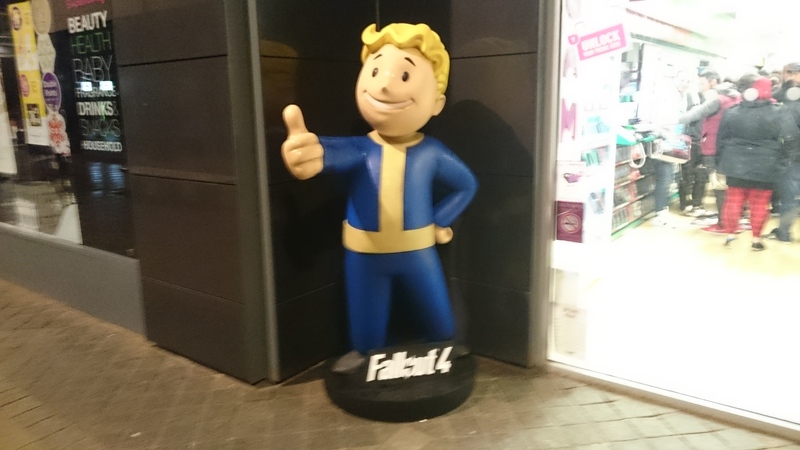 The closer we were approaching the GAME store, the more noise my pip boy was making. As soon as we reached the corner, we were delighted to see a healthy queue of happy vault dwellers. 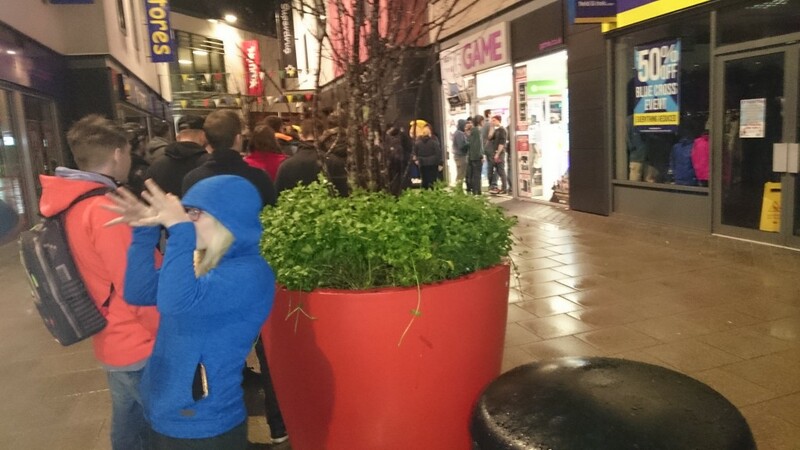 Just like the queue outside my vault in my Fallout Shelter app, people looked eager to make it to the till to get their precious copy of their favourite game, and I knew it was going to be a long night for all those people. In fact, I’m pretty sure that half the people in that queue haven’t slept since, and they are most certainly still playing the game as I’m writing those lines! All the dwellers in the queue had reserved their copy, we just came there for the competition and the atmosphere. A lovely GAME employee came to ask us if we needed any assistance, we explained to here that we were just there for the competition, she then showed us a poster which we had to scan using the scanner function included in the GAME mobile app (available on Android, IOS and Windows phone). We scanned it, it overlaid an AR promo video on top of the poster (well-made actually, it fitted well with the angle of the poster as she was moving it around) and that was it, we were officially part of the competition! Even though we didn’t come here to pick up our copy of the game, it was totally worth it just to get the free stuff, and of course to see the great chilled-out atmosphere. All our dwellers looked eager to get their much awaited copy of the game and happy to be part of a friendly crowd. In fact, this is the most chilled out midnight launch we’ve ever attended. Bethesda games seem to attract a certain type of crowd, I don’t want to type-cast people but the atmosphere was definitely very geek, all in the right ways! So without further ado, we bid you all farewell as we are off to explore the wasteland. See you guys in a few months, we will all have the biggest beards next time you speak to us, and we will most likely need to learn how socialize with people again; just the way we had to after the first year of the release of Fallout 3. Happy dwellings too you all!! !